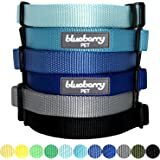 Sold by Blueberry Pet UK and Fulfilled by Amazon. Gift-wrap available. 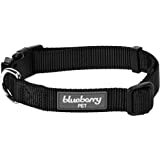 Sold by Blueberry Pet UK and sent from Amazon Fulfillment. Inspired by the warm weather, Blueberry Pet's new classic collection is perfect for everyday wear. 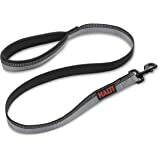 Elegant and simple, this classic solid dog leash is made to show off your dog's unique style all year long. 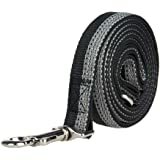 With the heavy duty spinning snap, this nylon strong dog leash is designed to last long. This product is available in 6 colors: Royal Blue, Dark Orchid, Neon Green, Florence Orange, Medium Turquoise, and French Pink. Don't miss out this deal for Christmas celebration. Got this when we got our rescue dog as an emergency and had nothing to walk her with. Is a bright colour (pink), very strong. The clasp definitely holds up to be pulled left, right and everywhere (she has never been walked on leads, ex dodgy breeder rescue). As she is a staff, I was unsure of how strong she was going to be I order the thicker width lead, which did make it a little awkward to hold for myself as don't have the largest of hands, rubbed the palms etc, definitely the it for the strength aspect but not for the width. Bought the match collar at the same time. Very pleased with it overall. A bit lighter weight and longer in use than I imagined which is often the case when relying on printed measurements. But the lead does the job and my dog is enjoying that extra little bit of freedom. 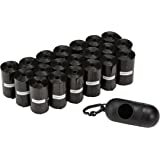 Easy to stuff in pocket when dog off lead. 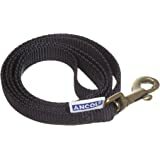 This is more secure than draping the lead around my neck and may mean it lasts longer than previous version. 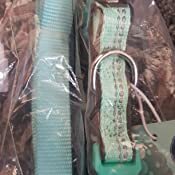 I purchased the light blue leash for my 8 week old toy puppy. It is fantastically made and appears to be very sturdy so far. My pup has tried to chew it and It looks as good as new. 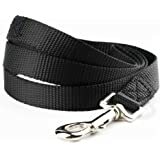 I have saw other people talk about how the clip which attaches to the dog's collar is quite heavy, I can certainly agree with this, it hangs down under the dog and sometimes gets caught in his feet. To be honest you should be holding the leash in such a way which means it is always over his head so this shouldn't be a problem. Also if you have a bigger pup or dog you should be fine. I will see how this performs as time goes on. 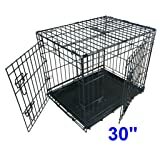 Ordered for my 4m Shih Tzu. The fired brick colour looks as lovely in person as I had hoped. Good quality material. 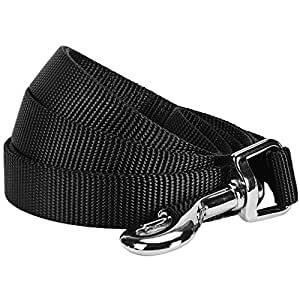 Bought the matching harness and collar so pup has the complete set to strut his stuff in style. No complaints and extremely pleased. Bought this to go with collar, its good quality but length is far too long for what I need. My dog walks right beside me when on a lead and I seem to have so much surplus lead to cope with. A great length for my border collie and loved the colour. Have washed it in washing machine several times with no problems. I needed a replacement lead and this one in emerald fitted the bill perfectly. It was a great price and really good quality.